Walt Disney Productions has entered the computer software market, and it's making its debut with the help of Mickey Mouse. Mickey in the Great Outdoors is a pair of interactive adventure games for children seven to ten years old. Mickey Goes Hiking develops grammar and spelling skills by requiring players to finish sentences and unscramble words to help Mickey through his adventure. Mickey Goes Exploring is a similar game, but is based on math skills and equation solving. 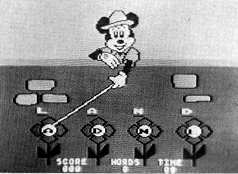 Mickey in the Great Outdoors, is being offered only for Atari computers, and distributed through Atari. This program, however, is just the tip of Walt Disney's software iceberg, according to the company. Plans call for as many as 50 additional Walt Disney programs to be released this year, supporting Atari, Radio Shack, Texas Instruments, NEC, and Panasonic computers, and distributed through those companies. in Mickey in the Great Outdoors.